The 2017-18 NBA regular season is done, and playoff seeding is set. The Boston Celtics now have their first-round opponent in the Milwaukee Bucks, and the schedule has been released. 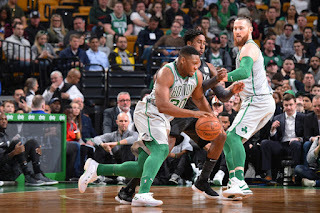 The path for them to get out of the first round will not be an easy one, having split the series with the Bucks over the regular season, though it's worth noting that at least one of those losses came a game after one of the most demoralizing moments of the season when Gordon Hayward got injured. With whispers Marcus Smart may be available by the last game of this series, one would hope we won't need him, but if this injury-depleted Celtics squad is to have a chance at winning this series, defending Giannis Antetokounmpo alone won't be enough, meaning Boston will have to find a way to keep the rest of Milwaukee's players from feasting as well. Whether that means some creative rotations, or hoping there's enough good nights on the offensive end of the floor to get past an inconsistent but still deadly Bucks team, it figures to be a close series. Boston's regular-season success has at least afforded the team home-court advantage, which could be huge down the stretch. The series begins on Sunday, April 15th in Boston, and remains there for the next match, on Tuesday, April 17th before heading to Milwaukee on Friday, April 20th. It'll continue on Sunday, April 22nd in the great state of Wisconsin before heading back to Boston on Tuesday, April 24th, should it be necessary (it'll be necessary). Should the series go to six games, it's back to Milwaukee on Thursday April 6th, and if seven games are needed - and they very well could be - we'll return to Boston for the final possible game of the series on Saturday, April 28th, just inside the earliest possible return date for Smart. It's crucial for Boston going into this contest believing they can beat the Bucks (because they can), but if things don't go their way early, it's also nice to know they may have a late-series addition the Bucks will have to adjust with no more games to retool if whatever they come up with a flop. Around the rest of the East, the field has been set, with the top- seeded Toronto Raptors drawing the eighth-seeded Washington Wizards, the third-seeded Philadelphia 76ers drawing the sixth-seeded Miami Heat, and the fourth-seeded Cleveland Cavaliers drawing the fifth-seeded Indiana Pacers. The peculiarity of this season seems to have ended up producing some compelling early matchups, as it's not clear any of these teams has a cakewalk into the second round. "Upsets" are probably going to be less of a thing than "survivors", at least for this round. Should Boston make it out of the first, it'll face the winner of the 76ers-Heat series, and should they somehow survive beyond that, will look to take on whichever squad has emerged out of the Raps-Wiz-Cavs-Pacers bracket to get to the finals. The odds of getting there are by no means high, but arguably no worse than last season, and quite possibly better. Only the 76ers are playing like a team on fire, riding a franchise-record 16-game winning streak into the playoffs, and only the Raptors are playing with point differentials resembling a true contender. Boston has won three of four regular-season games against Philly, and split their season against Toronto and Indiana. But they also have losing records against the rest of the field coming out of the east, and, in a season so heavily impacted by injury (and not just with Boston), predicting who'll win where is almost impossible. Give us your best guesses for how the east will shake out in the comments below. Whatever ends up going down, 2019's just around the corner.